Three Lake Charles Civic Ballet (LCCB) company dancers Marietta Campagna, Adrian Durham, and Katelyn Chargois had ‘intense’ summers. All three dancers participated in a classical ballet summer intensive workshop. Marietta has been a Lady Leah Lafargue School of the Dance (LLL) student for almost 10 years. This is her second year as a LCCB dancer, and her second Summer Intensive (SI) with LCCB. Adrian started his dance career five years ago with LLL and has been a LCCB company dancer for three years. This year Adrian auditioned and was accepted to Houston Ballet Ben Stevenson Academy 2011 SI. Therefore, three weeks of Adrian‘s summer was spent with LCCB and three weeks with HB in their new Center for Dance. Adrian has now completed five SI’s. Katelyn recently received her ten year certificate with LLL. She has been a LCCB company dancer for five years and has just completed her seventh SI. Katelyn auditioned this year for Joffrey Ballet in New York and Houston Ballet. She was accepted to both programs, but chose to attend Houston‘s SI. Katelyn attended all six weeks at HB’s Center for Dance. This was Katelyn’s second visit to HB for summer training. LCCB caught up with the three dancers to ask them some questions about their SI experiences. A simple interview sounds like it should be easy enough, but these dancers have been busy all summer, and with their upcoming season, it doesn’t look as though it will slow down anytime soon. Below is our question and answer session with the dancers. LCCB: It’s customary for students to record all corrections given by instructors. What corrections during your SI did you find most beneficial? Marietta: The corrections most helpful for me were to pull up and to stretch my foot instead of just pointing it. Adrian: I received two important corrections this summer—while at the barre I have to adjust my core to keep my balance instead of using the barre to keep the balance for me; and there are times when a dancer doesn’t know a step so you need to rely on yourself instead of just following someone else. Katelyn: I found the corrections on turns to be the most beneficial. We really worked on our body positioning this summer. When you turn you have to hold your core muscles and breathe. One of the main corrections that helped me with my turning was to think of having a short stomach and a long back. 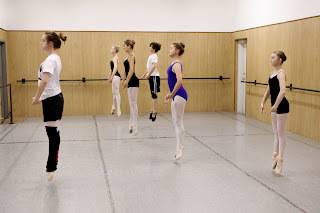 LCCB: Our company ballet class includes barre exercises and center work to develop proper technique. Tell us how summer intensive was able to develop your ballet class experience and dance training. Marietta: During the summer intensive classes we learned new and different combinations which helped me to improve a lot. Adrian: My studio in Lake Charles has only a few male dancers. In Houston, I had the opportunity to work with a large group of guys. With the larger group, there was a healthy competition between us, and I was able to let my personality come out working with a group of guys. Katelyn: During regular season your class time is shared—learning technique and choreography. You have more time during summer intensive to break things down and work on the details of your technique. Since there is more class time each dancer gets more individual corrections, too. LCCB: What were your favorite classes taken this summer? Marietta: It’s really fun to learn something new so my favorite classes this summer were musical theatre and jazz. I had a lot of fun in those classes. Adrian: (without hesitation) Weight training—I learned the proper technique for a male dancer. I have used weights in the past, but this summer I realized I wasn’t really working correctly. Partnering—this class helped me to understand each partner’s responsibility. We are a team, and we have to work together. Katelyn: My favorite class this summer was Composition Class—we called it comp. I loved this class because you use your ballet training, but comp is an improvisation class. As an assignment, we had to choreograph our own dances using improvisation. Improvisation gives you freedom. In ballet, you’re trained to do steps a certain way—holding your core and pointing your toes. In comp class, you use your ballet training, but you change the order of the steps to make them your own. It really helps dancers to step outside the box and have a little freedom with their dancing. Dancers need this freedom in order to be less tense and more fluid with their movement. LCCB: How did you feel about the class offerings and instruction by multiple teachers? Marietta: Multiple teachers really helped me a lot in learning to focus. The instructors all had different personalities, but they were all really fun to work with so I liked the variety of dance and instruction. Adrian: With a group of guys, we had classes that were focused for the male dancers. My view of barre has new meaning. Before this summer, I felt it was just something we had to do, but now I understand the need to warm up properly and to prepare properly for center. Katelyn: Having a variety of dance classes helps me be more relaxed in ballet, and learning different dance styles makes you better prepared for a dance career. One of the best things for me was working with the different teachers—you don’t have the repetition of having the same teacher every day. Every teacher sees different corrections to give a dancer. Sometimes they even have a different terminology for the steps. It’s good to learn from a variety of teachers so you can learn to take instruction from anyone. LCCB: What would you say was the most interesting class instruction you received during your SI training? Explain. in plié for your turns—really good technique in jazz. do—to make it look beautiful. This year Lake Charles Civic Ballet has put together an exciting season. During December, they will perform Rudolph the Red-Nosed Reindeer for school groups as well as a matinee and a gala performance for the community. In March 2012, Lake Charles Civic Ballet will perform a full-length ballet The Sleeping Beauty accompanied by the Lake Charles Symphony in the Rosa Hart Theatre. The training that Marietta, Adrian, and Katelyn gained this summer plays a big part in their preparation for such a daring season.